Investigating one of the Caribbean’s most important archaeological sites. One of the most unique and important archaeological sites in the Caribbean is located on the south shore of Middle Caicos. Various archaeologists have worked at the site since 1912, continuously trying to answer new questions with new techniques. 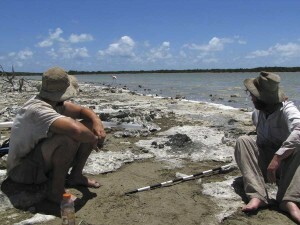 In May and June 2010, I returned to Middle Caicos to investigate salt production on Armstrong Pond. We were living at the Turks & Caicos National Trust research facility in Bambarra, and greatly appreciate the assistance of their Director Ethlyn Gibbs, and permission to conduct the research granted by Wesley Clerveaux and Eric Salamanca of the Department of Environmental and Coastal Resources. The site, known as MC-6, is a 3.5 km trek through the bush. Although a trail had been cut and partially maintained, it was mostly reclaimed by dense vegetation. We spent six eventful days re-cutting the trail, eventually losing it just north of the pond where Hurricane Ike had particularly devastating consequences. Working in the pouring rain, swarmed by the worst mosquitoes in living memory on Middle, breaking a machete on a particularly hard tree, and at first-go missing the pond to the east, we eventually reached our destination. Although we cursed the days spent clearing the trail, we were rewarded by the discovery of the site and the desolate salina of incomparable beauty. The salina is a very flat area just south of Middle Caicos and stretches between true dry land of Middle and the Caicos Bank. Even with a slight increase of water level, by a hurricane or a storm, the salina is under water. But in prehistoric times, this area was inundated and the settlement did not border a salina but had immediate access to the Caicos Bank. Although access to the marine resources of the Caicos Bank was of significance for these people, other locations in the Caribbean are also known for their fertile marine banks. In addition, an enormous amount of marine resources was not necessarily needed, because Middle Caicos never harbored a large population in prehistoric times. Transport of fish to Hispaniola, where large populations were living and, especially in the interior, needed fish and proteins to supplement their diet, was prohibited by preservation issues. A canoe trip to Hispaniola, a 120 km voyage, lasted at least a couple of days and transport to the interior added more time to this journey. By the time the fish arrived, it would have rotted and been inedible. So why is MC-6 so important? Besides the dietary need of salt in a human diet, salt is a preservative. The fish could be caught on the Caicos Bank and immediately salted, preserving the meat over much longer periods of time. The presence of salt enabled people to catch fish and transport it to Hispaniola. At the time that MC-6 was inhabited (around AD 1200), archaeological deposits on the coast of Hispaniola already showed signs of overfishing and the lack of large mammals on Caribbean Islands forced people to rely on fish for their proteins. The combination of both salt and fish relatively close to the chiefdoms of Hispaniola became a powerful resource for elites to control, because they could supply these essential resources to large populations. Their ability to supply these goods to recipients and followers must have been reflected in an increase of social status and power among the chiefs. To understand the exact relationship between salt and MC-6, we needed to look at Armstrong Pond and the settlement in more detail. In previous research, it was always assumed that salt was produced approximately 500 years ago, but information on Armstrong Pond’s past was not available. Furthermore, the stone circles that surround the plaza at MC-6 were considered houses or storage facilities for salt and salted fish, but detailed excavation data was also lacking. These two locations, the pond and the stone circles, were targeted this year for study. At Armstrong Pond, over 50 cores were taken from the middle of the pond. We had to walk into the pond with a corer and push it into the sediment. Because the corer was made of transparent plastic, we could analyze the sediments immediately and photograph them in their original context. The idea behind the coring was to investigate the history of the pond, because the lower sediments in the core were deposited earlier than the sediments on top. By going down in the deposits, you can go back through time and see what happened in the past. Another quality of sediments is really important for this sort of analysis. Different sediments, like clay, silt or sand, settle in different circumstances and give information on previous environments. Clay and silt depositions only settle when the body of water is barely moving, and especially clay is only expected in circumstances without any currents. The larger fractions, such as sand and small rocks, will only deposit while water is still flowing. In other words, clay and silt are only expected in relatively stable environments, while sand suggests a more dynamic context. Armstrong Pond is today disconnected from the sea and water input is dependent on rainwater and the filtration of sea water through the subsoil. Both inputs are under relatively low velocity, which was underlined by the clay and silty top-layer in all the cores across the pond. However, in most cores from Armstrong Pond, we found multiple layers of sand. These layers of sand must have been deposited at times when water was flowing into the pond and water levels were higher as they are now. Hurricanes can cause significant short-term increases of water tables, but it is also possible that the water table was structurally higher for a period of time. Dating the different layers, which is planned for 2011, will illuminate the time-line of these events. Archaeological excavations at the settlement were focused on the stone structures and were aimed at explaining the original function of these structures. All locations were carefully recorded and artifacts were collected in 10 cm levels to describe the chronology. This principle works the same as for the sediments in the pond, where older artifacts are located in the lower levels of the excavations. Separating the artifacts in different levels enables us to discuss changes through time based on the artifacts that were found. The settlement was full of artifacts. We encountered numerous pottery sherds, fauna material and pieces of coral and shell that were obviously modified after their use as tools. Some pottery, known as Palmetto Ware, was locally produced, but other styles, such as Meillacan, Ostionan and Chican pottery came from Hispaniola. These pottery sherds had little pieces of volcanic rock in them and because volcanoes are absent in the Bahamian archipelago, these needed to have come from elsewhere. The pottery sherds are clear evidence for contact with Hispaniola and other islands. Most faunal material was fish bones, but birds, iguanas, hutias (small rodents that were endemic to the Caribbean) and turtles were also represented. This shows that Lucayan people had a large variety in their diet and although fishing practices were common, other resources were not untouched. The Spanish have mentioned that iguanas and hutias were exclusive foods for chiefs and commoners, which suggests that MC-6 was inhabited by elites and that special dinners were prepared and consumed here. Lucayan people, as many other groups in the Caribbean, used shell and coral as tools. The lip of Queen Conch, for example, could be used as an ax to prepare gardens and chop down trees. Bivalves, such as Codakia orbicularis, could be used as scoops for food, shell net weights or scrapers for pottery making. The rough outside of coral could be used for modifying wood or grinding corn and manioc, staple foods in Lucayan diets. Besides these functional roles, shell was also used for decorative purposes and beads, shell inlays in wooden artifacts, and decorative pieces were found as well. Good archaeological practice means that old assumptions and new hypotheses are constantly questioned and tested. Despite the obvious geographical relation between MC-6, the Caicos Bank and Armstrong Pond, we cannot assume that people were using salt to preserve fish without strong archaeological evidence. This summer’s project focused specifically on the availability and use of salt as an economic resource at this prehistoric site. The recovered data allows us to make more detailed statements about the practices of the people living at MC-6 and how they used resources from their environment to make a living. Finally, the excavations will also shed light on the importance of salt in prehistory, as this “white gold” has been neglected in many archaeological studies in the Caribbean region. Joost Morsink is a Ph.D. student from the Netherlands, studying Caribbean Archaeology at the University of Florida. This research was funded by the National Science Foundation with a Doctoral Dissertation Improvement Grant.